Oil Change: Why Use Synthetic Oil? A lot of car owners don’t think about different types of oil when going for an oil change. But, the truth is, various types of oil do different things for your engine. One major distinction between oil types is: Regular oil vs. Synthetic oil. 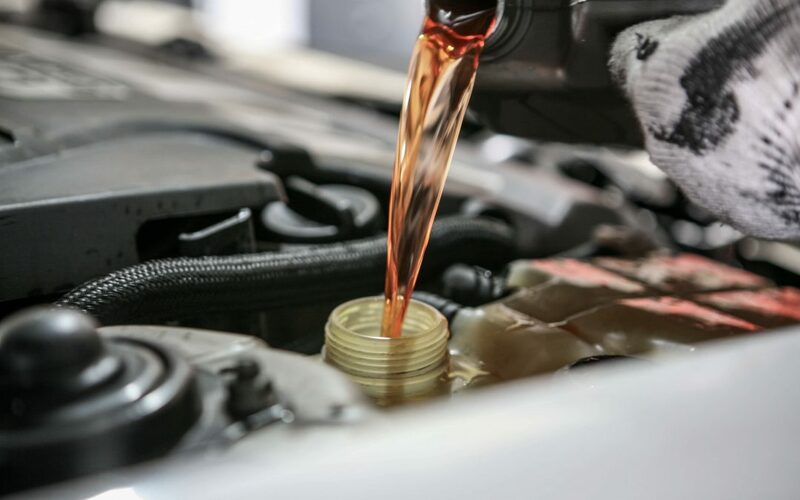 The major difference between synthetic and regular oil is the enhanced protection and performance synthetic motor oil provides for your vehicle. But, the differences don’t stop there. In fact, about the only thing the same about regular oil and synthetic oil, is that they both originate in the ground. Beyond that, the two substances are vastly different. Most people don’t think of high quality when they hear the word synthetic. Usually it means fake or low quality. However, this is not true when it comes to oil. When talking about oil, synthetic typically refers to a superior product. The word synthetic means fabricated or manufactured, which is exactly what synthetic oil is. How is synthetic oil made? Manufacturing synthetic oil is a complex and intensive process. Synthetic oil is refined and broken down to a molecular level. Through a distillation process, the impurities in the oil are extracted and the molecules are then customized to meet the specific needs of today’s car engines. When synthetic oil is tailored to particular engine needs like this, it helps afford a higher level of performance and also better protection for your engine. Other useful additives are then combined with the oil to produce a synthetic blend. The metal parts of your engine are in continual contact with one another. Without oil, the friction created by this contact would destroy your engine very quickly. So, it stands to reason, that higher quality oil would provide added lubrication. Regular oils break down more quickly, leaving your engine exposed to damaged if not changed promptly when it is time for an oil change. Synthetic oils provide longer lasting protection against engine wear. Synthetic oil also helps keep your engine cleaner and running more smoothly. Synthetic oils run at a higher level of efficiently, keeping your engine cleaner and your oil less contaminated with dirt and debris. Conventional oils become polluted much more quickly, and can eventually start to form sludge if left unchanged for too long. Synthetic oils begin with fewer impurities that combat debris build up and sludge formation. A cleaner oil leads to a cleaner engine, which leads to improved fuel economy. Synthetic motor oil performs better in very low temperatures, as well as very high temperatures. Conventional oils do not adapt to polarizing weather conditions in the same way. Conventional oil takes longer to begin flowing through your engine. This is magnified in cold temperatures, meaning you must wait longer for adequate engine protection. Synthetic oil also performs better in high temperatures. In the summer your engine can get very hot. Synthetic oil provides extra protection against your engine overheating. Conventional oils will break down and evaporate more quickly in extreme heat. Synthetic oil provides better protection for your engines working components, like the pistons and other continually moving metal parts. Cars being manufactured these days tend to have smaller engines to improve fuel economy. This involves adding a specialized turbo charger to increase engine power. These turbo chargers cause the engine to operate at higher temperatures. Conventional oil is less effective for this type of engine because they break down faster due to high heat, and tend to leave behind deposits and debris. This does not mean synthetic oil is not compatible with older vehicles, all engines can benefit from synthetic oil. Not only is synthetic oil more effective and efficient, it also lasts longer. This means you will need to change it less frequently without having to worry about engine damage. Valvoline Express Care is a professional automotive service provider in the Brampton area. Valvoline specializes in oil changes and can handle any other type of maintenance you may need for your automobile. There are a variety of options to choose from when having your oil changed with Valvoline. You will have a couple different selections of synthetic oils to choose from to keep your vehicle protected and performing at optimal efficiency.